This is the first animated adventures “annual,” the first of several anthologies of shorter stories that appeared over the years. This particular issue is notable because it’s the first appearance of Roxy Rocket, several years before her animated episode appearance. 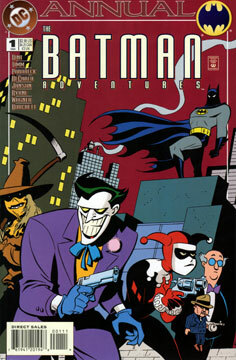 All the stories are by Paul Dini. The framing story (art by Bruce Timm!) concerns Batman’s pursuit of Roxy. She escapes, and he returns to the Batcave. Batman and Alfred proceed to discuss the many villains that almost straightened up their acts, but inevitably failed and returned to lives of crime. First up is a fun story about the Ventriloquist, with art by the mighty Mike Parobeck and the always welcome Matt Wagner. Arnold Wesker gets a job as a puppeteer on a local kids TV show, just before it gets cancelled. When the star of the show figures out who Wesker was, she manipulates him into getting revenge on the executive who cancelled the show, using a reproduction of Scarface. The plan ultimately fails, but not before Wesker finds himself in the middle of an argument between Scarface on one hand, and his frog puppet on the other. That’s good stuff! Next up is a brief, “silent” story rendered by Dan DeCarlo (of Archie fame) and Timm. Harley is released from Arkham, manages to get into trouble, and is returned within 24 hours. I was never much of an Archie fan, but it’s fun to see DeCarlo’s take on Harley. Scarecrow stars in “Study Hall” next. The story and script are interesting. Scarecrow assumes the role of a professor again, under an assumed name. When his favorite pupil suffers violence at the hands of a male student during a date, the Scarecrow intends revenge on the boy. Batman intervenes, of course. I find this interesting because it contrasts “super-villain” crime against the more mundane and but equally scary kind. Sadly, the most notable thing about this tale is the art. I don’t care for it at all. Klaus Janson didn’t even attempt to create an animated style look. He was a poor choice. The framing story then wraps up, with Timm back on art duties. Catwoman commits a robbery and tries to frame Roxy for it. Roxy and Batman both pursue Catwoman, only to lose her. The story is simple and straightforward, with excellent art. Finally, there’s a “bonus” story about Joker trying to make his way home after a night of battling the Batman. The art is by the legendary John Byrne. Generally, his style is too “messy’ for an animated tale, but Rick Burchett’s inks manage to reign in Byrne. Overall, the tale is silly fun. The Roxy story can probably fit in after her animated episode, with a little creative license. The others could take place almost any time. I’d love to see some customs of Wesker with his frog puppet. Yes, if only for Dini’s words and Timm’s art.